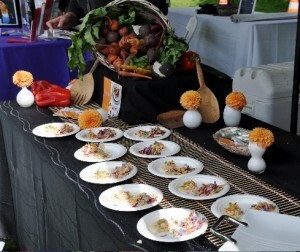 Cabrillo College culinary arts students used their talents to transport dinner guests to Morocco at the Santa Cruz Cancer Benefit Group’s Spring Forward Against Cancer gala earlier this month. The successful benefit, held at Sesnon House, raised thousands of dollars for cancer research via Santa Cruz Cancer Benefit Group (SCCBG). 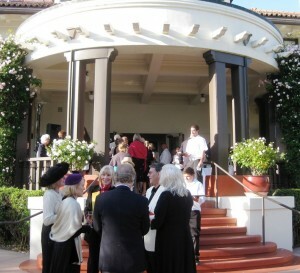 To celebrate SCCBG’s 20th anniversary in a grand fashion, event organizers used the theme “A Night in Casablanca.” Attendees enjoyed an atmosphere modeled on “Rick’s Café Américain” which included live piano, first-rate food and wine prepared and served by Cabrillo students, and KSBW news anchor Dale Julian serving as emcee. There was a silent auction with prizes such as a trip to France, local handmade jewelry, and restaurant gift certificates. 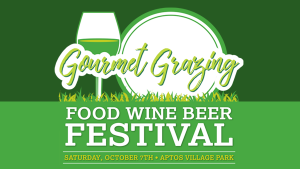 If it’s not already on your calendars, make sure to save the date for September’s Gourmet Grazing on the Green: it’s Saturday, Sept. 19, 2015 at Aptos Village Park. The annual event hosted by SCCBG usually sells out a few days ahead of time. 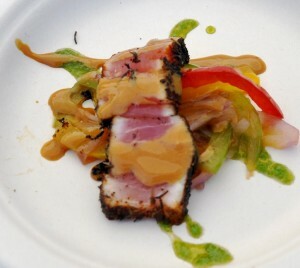 I’ll be sure to publish a preview/ reminder article as the food and wine celebration gets closer. It’s a wonderful event; last year there were more than 25 participating restaurants, farms, and food vendors plus a couple dozen wineries, breweries and distilleries. Attendees pay one admission price to benefit SCCBG and then receive complimentary food and drinks from the generous local chefs, winemakers, etc. who have donated their products. The annual Gourmet Grazing on the Green allows attendees to partake in unlimited wine and beer plus lots of delicious gourmet food from local restaurants and food vendors, while raising funds for the Santa Cruz Cancer Benefit Group (SCCBG). 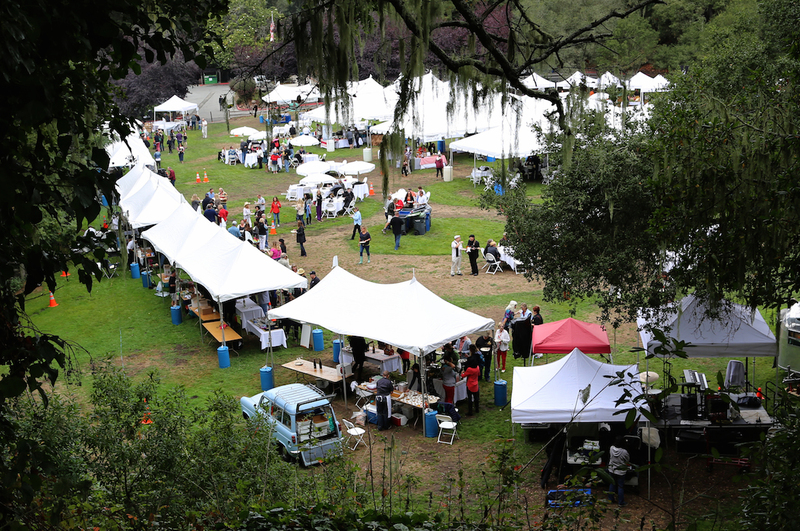 The 10th annual Gourmet Grazing is on Sat Sept 21, 2013 from 12-4 p.m. at Aptos Village Park. The event usually sells out a few days ahead of time, so it’s recommended that you buy tickets immediately. Purchase tickets for $65 at New Leaf Community Market or online. If you have a group of 10, you can get tickets for $50 each. Admission includes food, wine, beer, a souvenir wineglass, and live music. SCCBG board member Mary Anne Carson explains the festival’s popularity: “We offer the ‘best of Santa Cruz County’ all in one beautiful spot for a great value! Grazing is a delight for all of the senses: smell, sight, sound, touch and best of all, taste! We’ve offered high quality at a great value for the past 10 years which is why this event has a strong loyal following and will sell out! Every year there is something new and every year the food purveyors, restaurants and chefs have become more creative.” Some of my favorite dishes from last year’s festival included The Whole Enchilada’s squash blossom and zucchini tamale with avocado green salsa, and Café Cruz’s Southwestern gazpacho with shrimp. For more 2012 highlights, see my recap article. There are more than 30 participating restaurants and food vendors for 2013 including The Crow’s Nest, Café Cruz, Penny Ice Creamery, The Whole Enchilada, Fresh Prep Kitchens, Solaire Restaurant and Bar, Hula’s, The Fish Lady, New Leaf Community Markets, Friend in Cheeses Jam Co., Niman Ranch, Redwood Hill Farm, Zameen Mediterranean Cuisine, Sweet Cheeks Bakeshop, and True Olive Connection. Some highlights: Cafe Rio will serve “Rio Prawn Spring Roll” which includes mung bean noodle & sprouts, carrot, green onion, basil, mint, and house made hoisin sauce. Severino’s will be serving lobster ravioli in a cherry white wine cream sauce paired with a raspberry salad. Together We Eat Catering is serving a Summer Strawberry Panini featuring strawberries from California Giant Berry. East Side Eatery is serving Chicken Pozole with chicken, hominy, spicy tomato broth, and garnish of fresh corn, cilantro, green onions, queso fresco, lime wedges, sour cream, tortilla strips, and diced jalapeños. More than 25 participating wineries and breweries include Alfaro Family Vineyards and Winery, Beauregard Vineyards, Burrell School Vineyards, Hunter Hill Vineyard & Winery, Heineken, Santa Cruz Mountain Brewing, Santa Cruz Mountain Vineyard, Seabright Brewery, Sones Cellars, Bonny Doon Vineyards, and Vino Tabi. One highlight: Sante Arcangeli Family Wines will be pouring their 2011 Chardonnay, Split Rail Vineyard & 2011 Corralitos Duet Pinot Noir. For the full list of participating restaurants, wineries, breweries, and exhibitors, click here. All funds raised by SCCBG through events stay local. “We’ve raised well over $1 million since our inception in 1995 for the benefit of and distribution to local cancer support groups and cancer research at UCSC,” says Mary Anne Carson. “This is one of the hardest working, most passionate group of individuals I’ve ever encountered. SCCBG is an all volunteer organization.” Proceeds from SCCBG’s events, including this year’s Gourmet Grazing, benefit these local cancer support and research organizations: Hospice of Santa Cruz County, Jacob’s Heart Children’s Cancer Support Services, The Katz Cancer Resource Center, UCSC Cancer Research, and WomenCARE. Last year the event raised more than $65,000 (up from $56,000 in 2011). More details: there is free parking and free shuttle service (every 15 minutes) from Cabrillo College Lot E. There will be a raffle, with ticket sales benefiting SCCBG. Prizes include gift baskets and gift certificates contributed by businesses such as Whole Foods Market, Trader Joes, Paradise Grille, and Coke Farms, a wetsuit from O’Neill, wine tastings, and wine.